This article is about the footballer and politician. For the journalist and politician, see Andriy Shevchenko (politician). This name uses Eastern Slavic naming customs; the patronymic is Mykolayovych and the family name is Shevchenko. Andriy Mykolayovych Shevchenko (Ukrainian: Андрій Миколайович Шевченко, pronounced [ɑndˈrij mɪkoˈlɑjovɪtʃ ʃɛwˈtʃɛnko]; born 29 September 1976) is a Ukrainian politician, football manager and former professional footballer who played for Dynamo Kyiv, Milan, Chelsea and the Ukraine national team as a striker. From February to July 2016, he was an assistant coach of the Ukraine national team, at the time led by Mykhailo Fomenko. On 15 July 2016, shortly after the nation's elimination from UEFA Euro 2016, Shevchenko was appointed Ukraine's head coach. Shevchenko is ranked as the fifth top goalscorer in all European competitions with 67 goals. With a tally of 175 goals scored for Milan, Shevchenko is the second most prolific player in the history of the club, and is also the all-time top scorer of the Derby della Madonnina (the derby between Milan and their local rivals Internazionale) with 14 goals. Furthermore, he is the all-time top scorer for the Ukrainian national team with 48 goals. Shevchenko's career has been highlighted by many awards, the most prestigious of which was the Ballon d'Or in 2004 (becoming the third Ukrainian, after Oleh Blokhin and Igor Belanov, to receive it). He won the UEFA Champions League in 2003 with Milan, and he has also won various league and cup titles in Ukraine, Italy and England. He was also an UEFA Champions League runner-up in 2005 and 2008. He was named in the FIFA World XI for 2005. In his illustrious international career, the striker led Ukraine as captain to the quarter-finals in their first ever FIFA World Cup appearance in 2006, and also took part at UEFA Euro 2012. On 28 July 2012, Shevchenko announced that he was quitting football for politics. He was standing for election to the Ukrainian Parliament in the October 2012 Ukrainian parliamentary election, but his party failed to win parliamentary representation. Shevchenko was born in the family of Praporshchik Mykola Hryhorovych Shevchenko in 1976. In 1979, his family moved to the newly built neighborhood in Kiev – Obolon (Minsk District was created in 1975). In Kiev, Shevchenko went to the 216th City School and in 1986 (aged 9) enrolled into the football section coached by Oleksandr Shpakov. Because of the accident at the Chernobyl Nuclear Power Plant, together with his sport group he was evacuated temporarily from the city. At an early age, he also was a competitive boxer in the LLWI Ukrainian junior league, but eventually he elected to move on to football. In 1986, Shevchenko failed a dribbling test for entrance to a specialist sports school in Kiev, but happened to catch the eye of a Dynamo Kyiv scout while playing in a youth tournament, and was thus brought to the club. Four years later, Shevchenko was on the Dynamo under-14 team for the Ian Rush Cup (now the Welsh Super Cup); he finished as the tournament's top scorer and was awarded a pair of Rush's boots as a prize by the then-Liverpool player. Shevchenko started out his professional career at age 16 when he came on for only 12 minutes as a substitute in a 0-2 home loss to the Odessa second team Chornomorets-2 Odessa on 5 May 1993. He was a substitute for the last six home games of the 1992–93 Ukrainian First League and did not score any goals. The next 1993–94 season at the second tier, Shevchenko was the top goal scorer for Dynamo-2 with 12 goals, and he made his first appearance in the starting XI. Shevchenko scored his first goal against Krystal Chortkiv at the home 1-1 draw on 7 October 1993. During the same season, he recorded his first hat-trick in a home game against Artania Ochakiv on 21 November 1993 which Dynamo-2 won 4-1. Shevchenko stayed with Dynamo-2 until the end of 1994 and once again he was called up for one game in late 1996. He made his Premier League debut for Dynamo senior squad on 8 November 1994 in an away game against Shakhtar Donetsk when he was 18. It was actually his second game for the senior squad overall after he played a home game of National Cup competition on 5 November 1994 against Skala Stryi. That year Shevchenko became a national champion and became a cup holder with Dynamo. He won his second league title the next season, scoring 6 goals in 20 matches, and scored a hat-trick in the first half of a 1997–98 UEFA Champions League road match against Barcelona, which Dynamo won 4–0. His 19 goals in 23 league matches and six goals in ten Champions League matches (including a hat-trick over two legs against Real Madrid) were followed by 28 total goals in all competitions in 1998–99. He won the domestic league title with Dynamo in each of his five seasons with the club. In 1999, Shevchenko joined Italian club A.C. Milan for a then-record transfer fee of $25 million. He made his league debut on 28 August 1999 in a 2–2 draw with Lecce. Alongside five other players — Michel Platini, John Charles, Gunnar Nordahl, Istvan Nyers, and Ferenc Hirzer — he managed, as a foreign player, to win the Serie A scoring title in his debut season, finishing with 24 goals in 32 matches. Shevchenko maintained his excellent form into the 2000–01 season, scoring 24 goals in 34 matches. Shevchenko also managed to score nine goals in 14 matches in the Champions League. Milan, however, failed to get past the second group stage. Despite netting only five times in 24 matches, mainly due to injuries, Shevchenko became the first Ukrainian-born player to win the Champions League after Milan lifted their sixth trophy in 2002–03. He scored the winning penalty in the shoot out against arch-rivals Juventus in the final, which had ended goalless after extra time. Following Milan winning the Champions League, Shevchenko flew to Kiev to put his medal by the grave of Valeriy Lobanovskyi (who he was managed by when he was at Dynamo), who died in 2002. He finished top goalscorer in Serie A in 2003–04 for the second time in his career, scoring 24 goals in 32 matches as Milan won the Scudetto for the first time in five years. He also scored the winning goal in the UEFA Super Cup victory over Porto, leading to Milan's second trophy of the season. In August 2004, he scored three goals against Lazio as Milan won the Supercoppa Italiana. Shevchenko capped off the year by being named the 2004 European Player of the Year, becoming the third Ukrainian player ever to win the award after Oleg Blokhin and Igor Belanov. 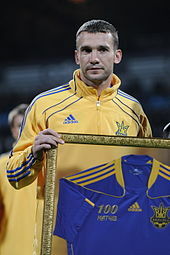 In the same year, Shevchenko was also inducted into the FIFA 100. He scored 17 goals in the 2004–05 season after missing several games with a fractured cheekbone. Shevchenko made Champions League history the following season; on 23 November 2005, he scored all four goals in Milan's 4–0 group stage drubbing of Fenerbahçe, becoming only the fifth player to accomplish this feat; his company includes Marco van Basten, Simone Inzaghi, Dado Pršo and Ruud van Nistelrooy (while Lionel Messi joined that group in the 2009–10 season and Robert Lewandowski in 2012–13), and the only one to have done it in an away game. Milan eventually lost the tournament when Shevchenko missed the crucial penalty in the final against Liverpool. In the 2005–06 season, he scored his last Milan goal in the second leg of the quarter-finals as they eliminated Lyon after a last-minute comeback in a 3–1 victory. In the semi-finals, Milan lost to eventual winners Barcelona 1–0, a match where Shevchenko controversially had a last minute equalizer denied by the referee. Despite this, he still ended up being the top scorer of the whole competition with 9 goals in 12 games. On 8 February 2006, Shevchenko became Milan's second highest all-time goalscorer, behind Gunnar Nordahl, after netting against Treviso. He finished the season as joint fourth-top scorer with 19 goals in 28 games. 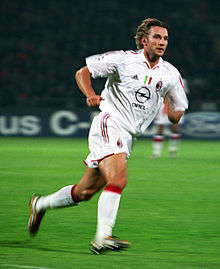 Shevchenko ended his seven-year stint with Milan with 175 goals in 296 games. During the summer of 2005, there were persistent reports that Chelsea owner Roman Abramovich offered a record sum €73 million and striker Hernán Crespo to Milan in exchange for Shevchenko. Milan refused the monetary offer but took Crespo on loan. Chelsea chief executive Peter Kenyon was quoted as saying, "I think Shevchenko is the type of player we would like. At the end of the day to improve what we have got, it has to be a great player and Shevchenko certainly comes into that class." Shevchenko cited that the persistence of Abramovich was a key factor in his move. Milan, desperate to keep the striker, offered Shevchenko a six-year contract extension. Shevchenko with Chelsea in 2007. On 28 May 2006, Shevchenko left Milan for Chelsea for £30.8 million (€43.875million), topping Michael Essien's transfer fee from the previous year and also breaking the record for a player signed by an English club. He received the number seven shirt, as Chelsea manager José Mourinho said that Shevchenko could continue wearing it. Shevchenko made his debut for Chelsea on 13 August 2006 in the FA Community Shield, scoring his side's goal in a 2–1 loss to Liverpool. On 23 August, he scored his first Premier League goal — and his 300th in top-flight and international football — in a 2–1 loss to Middlesbrough. He scored goals sporadically throughout the season, including equalisers against Porto and Valencia in the Champions League and another against London rival club Tottenham Hotspur in the FA Cup to help take his side into the semi-finals. He finished with a total of 14 from 51 games. During the campaign, he netted his 57th career goal in European competitions, leaving him second behind Gerd Müller on the all-time European goalscorers list, before Filippo Inzaghi made the record his own in the 2007–08 season. Shevchenko's 2006–07 season was cut short due to injury and a hernia operation. He missed the Champions League semi-finals against Liverpool and the FA Cup Final against Manchester United at the new Wembley Stadium on 19 May 2007. He did, however, start for Chelsea in the 2007 League Cup final victory over Arsenal in which he hit the bar which would have given Chelsea a 3–1 lead. Shevchenko was handed his first start of the 2007–08 season against Blackburn Rovers at home to cover for the injured Didier Drogba, but the game finished goalless. His first goal of the season came three days later, equalising for Chelsea in a match against Rosenborg, which turned out to be José Mourinho's last game as manager of Chelsea. Throughout the season, Shevchenko was in and out of the starting lineup because of injuries and the appointment of Avram Grant following the departure of Mourinho. During the Christmas period, however, Shevchenko enjoyed a good run of form. He scored the first goal in Chelsea's 2–0 win over Sunderland, and he was named Man of the Match in Chelsea's 4–4 draw against Aston Villa at Stamford Bridge, scoring twice (including a stunning 25-yard shot into the top left hand corner) and assisting Alex to make the score 3–2 in Chelsea's favour. Shevchenko scored his last goal in the 2007–08 season in a 1–1 draw with Bolton Wanderers. He finished the season with five league goals in 17 games. Shevchenko also played a part in a pre-season match which was against his former team, Milan. Shevchenko was not used very often in the starting lineup at Chelsea, and with the appointment of Luiz Felipe Scolari, he was deemed surplus to requirements. Due to this, Milan vice-president Adriano Galliani offered to take Shevchenko back to the San Siro and Shevchenko was loaned back to his old club for the 2008–09 season. Shevchenko's second spell was considered unsuccessful, as he failed to score any league goals and only scored 2 goals in 26 appearances, starting only nine of those games. At the end of the season, Milan confirmed that Shevchenko would be returning to Chelsea for the final year of his four-year contract. At the end of that season, it was also announced that Milan's manager, Carlo Ancelotti, would also be leaving to join Chelsea. Shevchenko was not even on the bench for Chelsea's penalty shoot-out victory over Manchester United at Wembley at the weekend in the season-opening Community Shield. After making a late appearance for Chelsea in their second game of the 2009–10 season, Ancelotti announced that Shevchenko would be likely to leave Chelsea before the summer transfer window closed. Despite this, Ancelotti said it had nothing to do with his decision to leave Shevchenko out of Chelsea's 2009–10 Champions League squad, but just to continue playing first-team football. On 28 August 2009, Shevchenko signed a two-year deal at his former club Dynamo Kyiv and scored a penalty-goal in his first game upon returning to his former club against Metalurh Donetsk in Dynamo's 3–1 victory on 31 August 2009. He was mostly used as a left winger, and was named left winger in the 2009 team of the season. On 16 September 2009, Shevchenko played his first Champions League match after returning to Dynamo, against Rubin Kazan, in Dynamo's first game of the 2009–10 season. In October 2009, he was named the best player of the Ukrainian Premier League. On 4 November 2009, he scored a goal in the game against Internazionale, cross-city rivals of his former club Milan, in the fourth game of the Champions League season. It was the 15th goal he had scored against Inter in his career. On 25 August 2010, he scored a penalty against Ajax in the second game against two teams in qualifications level for 2010–11 Champions League. 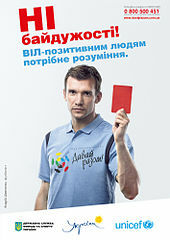 On 28 July 2012, Shevchenko announced that he was quitting football for politics. Shevchenko achieved 111 caps and scored 48 goals for the Ukrainian national team, whom he represented at the 2006 FIFA World Cup and UEFA Euro 2012. He earned his first cap in 1995 and scored his first international goal in May 1996 in a friendly against Turkey. During qualification for the 1998 World Cup, Shevchenko scored three times as Ukraine finished second in Group G to earn a place in the play-offs. Ukraine were knocked out 3–1 on aggregate by Croatia, the team who would go on to finish third in the finals, with Shevchenko scoring Ukraine's goal in the home leg. Ukraine performed similarly impressively in UEFA Euro 2000 qualifying, again making the play-offs after finishing one point behind World Champions France in Group 4. However, the team again failed at the play-off stage, losing to underdogs Slovenia. Overall, Shevchenko scored four times for Ukraine during their Euro 2000 qualifying campaign. In March 2000, Dynamo manager Valeri Lobanovsky became Ukraine's coach, with the aim to qualify for the 2002 World Cup finals. Shevchenko scored ten goals in the qualifiers, but Ukraine again failed to qualify after losing a play-off, this time against Germany. He then scored a total of three goals in Ukraine's Euro 2004 qualifying round, but the team failed to qualify for the play-offs, finishing below Greece and Spain in third place in Group 6. Shevchenko scored six goals in qualifying for the 2006 World Cup, to take his country to its first ever major tournament. He captained the team at the finals and scored in Ukraine's first ever World Cup win, a 4–0 defeat of Saudi Arabia. He then scored the winning goal from a penalty kick as Ukraine beat Tunisia 1–0 to qualify for the second round where, despite Shevchenko failing with their first kick, Ukraine knocked out Switzerland on penalties. Ukraine were then beaten 3–0 by eventual champions Italy at the quarter-final stage. After only playing two games for Milan in the 2008–09 season, Shevcehnko was still the first choice for Ukraine, and he scored an equaliser in an 2010 World Cup qualifying match against England at Wembley Stadium. Ukraine, however, went on to lose the game 2–1 after his former Chelsea teammate John Terry scored from a free kick delivered by David Beckham. Shevchenko celebrates scoring against Sweden at Euro 2012. In a 21 December 2009 interview with UEFA, Shevchenko declared that he was keen to play in his home country at Euro 2012. "After a disappointing 2010 World Cup qualifying campaign, that is my new challenge, or even dream. I will do everything to achieve that." In May 2012, Shevchenko was named in the Ukrainian squad for Euro 2012. In Ukraine's opening game, Shevchenko scored two headers to beat Sweden 2–1 in Group D. In Ukraine's final game, against England, Marko Dević scored a "ghost goal" in the second half, with Ukraine losing 1–0 to a Wayne Rooney goal. Dević's shot was hooked clear from behind the England goal-line by Shevchenko's former Chelsea teammate John Terry under the eyes of the additional assistant referee standing beside the goal (as confirmed by video replays). The incident reopened football's goal-line technology debate. Replays, however, also showed Artem Milevskiy should have been ruled offside before Dević's shot. After this game, Shevchenko announced he would retire from international football, having been Ukraine's youngest and oldest goalscorer and record marksman with 48 goals in 111 appearances. In November 2012, Shevchenko refused to accept Football Federation of Ukraine's proposal to become head coach of the Ukraine national team. A fast, hardworking, energetic, opportunistic and prolific goalscorer, Shevchenko was usually deployed as a centre-forward, although he was capable of attacking from the left wing as well, a position which he occupied at the beginning of his career and during his second stint with Dynamo Kyiv; he was also effective from set-pieces and was an accurate penalty taker. A strong and physical striker with an eye for goal, he was primarily known for his excellent positional sense and his powerful and accurate shot with either foot, although he also possessed good technique and aerial ability, and was capable of playing off of his teammates. From 16 February 2016 to 15 July 2016, Shevchenko served as the assistant manager of the Ukraine national team. On 15 July 2016, Shevchenko was appointed as manager of the Ukraine national team. The 39-year-old replaced Mykhaylo Fomenko, whose four-year spell ended with elimination at the group stage of Euro 2016. He signed a two-year contract with the possibility of another two-year extension. Former Italy and Milan defender Mauro Tassotti, who was assistant coach when Shevchenko was at Milan, joined his coaching staff, as did former Dynamo coach Raúl Riancho, and former Milan Youth System coach Andrea Maldera. In the late 1990s, Shevchenko and other teammates of Dynamo Kyiv publicly backed the Social Democratic Party of Ukraine (united). During the 2004 Ukrainian presidential election, Shevchenko publicly endorsed candidate Viktor Yanukovych. After his retirement in June 2012, Shevchenko immediately joined Ukraine – Forward! (formerly known as Ukrainian Social Democratic Party) and took second place on the party list for the October 2012 Ukrainian parliamentary election. This was in spite of him stating a month earlier that he wanted to coach after his playing career: "This is the world I understand, the world I want to stay in." In the election his party won 1.58% of the national votes and no constituencies and thus failed to win parliamentary representation. Shevchenko is married to American model Kristen Pazik. The couple met at a Giorgio Armani afterparty in 2002, and married on 14 July 2004 in a private ceremony on a golf course in Washington, D.C. They communicate with each other in Italian, though Shevchenko had previously made public his desire to learn English. After his return to Dynamo Kyiv in August 2009, the couple declared that they want their children to learn Ukrainian. The couple have four sons: Jordan, born on 29 October 2004, Kristian, born on 10 November 2006, Alexander, born on 1 October 2012 and Rider Gabriel, born on 6 April 2014. Shevchenko commemorated Jordan's birth by scoring against Sampdoria the following day (Milan won 1–0). Milan owner and former Prime Minister of Italy Silvio Berlusconi is the godfather of Shevchenko's first son, Jordan. The day after Christian's birth, Shevchenko scored in a 4–0 Chelsea victory over Watford and he and several of his teammates gathered and performed the popular "rock-the-baby" goal celebration as a tribute. Shevchenko is a close friend of fashion designer Giorgio Armani, and has modelled for Armani and opened two boutiques with him in Kiev. With his wife, he has started an e-commerce Web site called Ikkon.com, dedicated to men’s fashion and lifestyle. In June 2005, he became an ambassador for the SOS Children's Villages charity. Shevchenko also has a foundation to support orphaned children. Shevchenko, an avid golfer, participated in his first professional golf tournament, the Kharkov Superior Cup, in September 2013. Shevchenko represented the Rest of the World team against England for Soccer Aid on 8 June 2014. Shevchenko's first name (Андрій in Ukrainian) has multiple ways of being transliterated from its original spelling in the Ukrainian Cyrillic alphabet into the Latin alphabet. "Andriy" is the spelling used throughout the player's official web site. It has also been adopted by UEFA and FIFA and is the preferred spelling in most English publications (although "Andrii" is used by World Soccer magazine and "Andrei" by Sky Sports). The Ukrainian pronunciation is [anˈdrij]. Shevchenko features in EA Sports' FIFA video game series; he was on the cover of FIFA 2005, and was introduced as one of the Ultimate Team Legends in FIFA 14 and has been an Ultimate Team Legend in every FIFA game since. Anatoliy Tymoshchuk and Shevchenko being honored by UEFA in 2011 for their 100th cap. They are the first and second, respectively, most capped players in the history of Ukraine. Serie A Goal of the Year: 2004. FIFA World Cup qualification 2002 top scoring European with 10 goals. Excellence Guirlande D'Honneur by the FICTS. 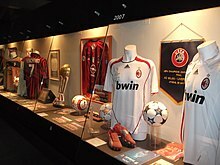 A.C. Milan Hall of Fame. L'Équipe Team of the Year: (2) 2004, 2005. Supercoppa Italiana all-time top scorer with 3 goals, alongside Alessandro Del Piero, Paulo Dybala, Samuel Eto'o, and Carlos Tevez. Ukraine all-time top scorer with 48 goals. Derby della Madonnina all-time top scorer with 14 goals. All-time Milan top goal scorer in Champions League with 33 goals. All-time FIFA World Cup qualification European top scorer with 26 goals. Top scorer in the history of football Ukrainian with 374 goals. ^ a b c d Dmytro Gorshkov (28 July 2012). "Shevchenko hangs up boots for politics". Yahoo! Sports. AFP. Archived from the original on 13 April 2014. ^ a b Oksana Grytsenko (2 August 2012). "Korolevska recruits acting, sports stars for campaign". Kyiv Post. Archived from the original on 2 August 2012. ^ a b "Ukraine's Ultranationalists Show Surprising Strength at Polls". The New York Times. 8 November 2012. Archived from the original on 9 November 2012. ^ a b "Proportional votes" (in Ukrainian). Central Electoral Commission of Ukraine. Archived from the original on 30 October 2012. ^ Sakakeeny, Bryan (23 August 2010). "Sporting Heroes: Why Andriy Shevchenko Is the Brett Favre of Soccer". Bleacher Report. Archived from the original on 13 April 2014. Retrieved 12 April 2014. ^ "Sheva ritorna dove è "nato"". La Gazzetta dello Sport (in Italian). 29 August 1999. Archived from the original on 18 October 2012. Retrieved 6 May 2011. ^ "AC Milan 3–1 Lyon (Aggregate: 3–1)". BBC Sport. 4 April 2006. Archived from the original on 1 January 2007. Retrieved 6 May 2011. ^ "Barcelona 0–0 AC Milan (agg 1–0)". BBC Sport. 26 April 2006. Archived from the original on 3 June 2011. Retrieved 6 May 2011. ^ "Top Scorers – Final – Wednesday 17 May 2006 (after match)" (PDF). 17 May 2006. Retrieved 6 July 2005. ^ "Sheva 56 Goals off Nordahl". A.C. Milan. 9 February 2006. Archived from the original on 3 September 2009. ^ "Milan reject Chelsea's world record bid for Shevchenko". ABC. AFP. 23 June 2005. Archived from the original on 18 June 2013. Retrieved 15 December 2011. ^ "Mourinho set for Shevchenko fight". BBC Sport. London. 16 May 2006. Archived from the original on 27 April 2010. Retrieved 1 January 2010. ^ "Abramovich lured me – Shevchenko". BBC Sport. London. 29 July 2006. Archived from the original on 9 December 2006. Retrieved 1 January 2010. ^ "none". World Soccer. June 2006. ^ AC Milan 2006 Annual Report (PDF). AC Milan (in Italian). April 2007. p. 65. Archived from the original (PDF) on 25 April 2011. Retrieved 24 April 2011. ^ Hayward, Ben (26 February 2012). "Crisis at Chelsea & Inter imploding ... but Jose Mourinho's transfer policy is not to blame - and he's leaving a legacy at Real Madrid". Goal.com. Archived from the original on 28 February 2012. Retrieved 12 April 2014. ^ "Chelsea complete Shevchenko deal". BBC Sport. London. 31 May 2006. Archived from the original on 26 July 2009. Retrieved 1 January 2010. ^ "It's No. 7 for Sheva". China Daily. 2 June 2006. Archived from the original on 25 June 2007. Retrieved 12 April 2014. ^ Hughes, Ian (5 December 2006). "Chelsea 2–0 Levski Sofia". London: BBC Sport. Archived from the original on 9 June 2007. Retrieved 2 June 2007. ^ "Shevchenko will miss FA Cup final". CNN. Reuters. Archived from the original on 13 May 2007. Retrieved 21 May 2007. ^ Kartmann (29 September 1976). "Shevchenko was not even on the bench for Chelsea's penalty shoot-out victory over Manchester United at Wembley at the weekend in the season-opening Community Shield". Espacefoot.net. Archived from the original on 20 March 2014. Retrieved 15 December 2011. ^ "Schewtschenko wechselt vom FC Chelsea nach Kiew" (in German). 29 August 2009. Retrieved 30 August 2009. ^ "Schewtschenko will Chelsea verlassen" (in German). Kölner Stadt-Anzeiger. Retrieved 29 August 2009. ^ Fifield, Dominic (29 August 2009). "Andriy Shevchenko leaves Chelsea to return to Dynamo Kyiv". London: The Guardian. Archived from the original on 1 September 2009. Retrieved 29 August 2009. ^ a b "Символическая сборная 2009-го года по версии читателей UA-Футбол". ^ "EURO dream fuels Shevchenko's fire". UEFA. 21 December 2009. Archived from the original on 4 June 2013. Retrieved 15 December 2011. ^ He failed to score against France or England and after the match against England he announced he would retire from international football after the next friendly "Ukraine 2 Sweden 1". BBC Sport. 11 June 2012. Archived from the original on 7 June 2012. Retrieved 11 June 2012. ^ "Euro 2012: Andrei Shevchenko revels in 'historic game'". The Times Of India. 12 June 2012. ^ Tidey, Will (19 June 2012). "Ukraine vs. England: Marko Devic Enters Goal-Line Technology Hall of Shame". The Bleacher Report. Archived from the original on 17 May 2014. Retrieved 19 June 2012. ^ Barlow, Matt (19 June 2012). "Ghost goal fury of Blokhin while Hodgson's happy to get rub of the green". Daily Mail. Mail Online. Archived from the original on 24 July 2012. Retrieved 19 June 2012. ^ "5 Famous Soccer Goal-Line Controversies". The Washington Post. 19 June 2012. Archived from the original on 20 March 2014. Retrieved 19 June 2012. ^ "England, France through to Euro 2012 quarters". Herald Sun. 20 June 2012. Archived from the original on 20 March 2014. Retrieved 20 June 2012. ^ "Ukraine denied equaliser against England as goal-line technology row raises its ugly head again". The Telegraph. 19 June 2012. Archived from the original on 20 June 2012. Retrieved 11 October 2013. ^ "Shevchenko to retire from national side". Yahoo! Sports. 19 June 2012. Archived from the original on 21 June 2012. Retrieved 19 June 2012. ^ "Konkov: Football Federation still searching for Ukraine manager". Kyiv Post. Interfax-Ukraine. 19 November 2012. Archived from the original on 19 November 2012. ^ a b c "Hall of Fame". AC Milan. Archived from the original on 8 December 2011. Retrieved 15 December 2011. ^ a b c Schianchi, Andrea (28 September 2004). "Cercasi anima gemella per Sheva". gazzetta.it (in Italian). La Gazzetta dello Sport. Retrieved 29 January 2015. ^ Parth Pandya. "Andriy Shevchenko: The Story of a True Legend in European Football". Bleacher Report. Archived from the original on 10 October 2012. Retrieved 10 April 2012. ^ "Andriy Shevchenko: Ukraine appoint former AC Mlian and Chelsea striker as manager". BBC.com. 15 July 2016. Retrieved 15 July 2016. ^ Andrew Wilson (2005). Virtual Politics – Faking Democracy in the Post-Soviet World. Yale University Press. p. 103. ISBN 0-300-09545-7. ^ a b c d "For Ukraine Striker, Ending Is Also a Beginning". The New York Times. 6 June 2012. Archived from the original on 7 June 2012. ^ "Ukraine's Shevchenko gives up soccer for politics". Reuters. 28 July 2012. Archived from the original on 4 July 2013. ^ a b Eve, James (3 September 2006). "The hired assassin". The Guardian; The Observer. London. Archived from the original on 25 September 2014. Retrieved 20 March 2014. ^ "American model wins most desirable Ukrainian football player". Pravda. 23 July 2004. Archived from the original on 9 June 2007. Retrieved 13 May 2007. ^ a b "The £30 million man". The Daily Mail. London. 12 September 2006. Retrieved 12 June 2012. ^ "Sheva swaps Ferraris for family". China Daily. 16 August 2006. Archived from the original on 3 June 2010. Retrieved 13 May 2007. ^ "Shevchenko wants his children speak Ukrainian". UNIAN. 8 September 2009. Archived from the original on 30 March 2010. Retrieved 15 December 2011. ^ Andriy SHEVCHENKO – four times a father! - FC Dynamo Kyiv official page. ^ "Shevchenko gives AC Milan victory". CNN. 30 October 2004. Archived from the original on 7 December 2008. Retrieved 13 May 2007. ^ "Milan keen on Shevchenko signing". BBC Sport. London. 15 June 2007. Archived from the original on 24 December 2008. Retrieved 19 August 2009. ^ Lovejoy, Joe (12 November 2006). "Chelsea 4 Watford 0: Drogba treble floors Watford". The Sunday Times. London. Retrieved 13 May 2007. ^ "Andriy Shevchenko pledges support for SOS Children's Villages" (Press release). FIFA. 16 June 2005. Archived from the original on 16 April 2007. Retrieved 20 May 2007. ^ "Andriy Shevchenko to make professional golf debut". CNN. Archived from the original on 12 September 2013. Retrieved 12 September 2013. ^ Fabio Ornano (15 November 2012). "MondoPallone Racconta… I primi 20 anni di FIFA". mondopallone.it (in Italian). Retrieved 17 March 2015. ^ "Football Legends Coming to FIFA 14 Ultimate Team". easports.com. 30 August 2013. Retrieved 17 March 2015. ^ shurik (17 October 2011). Шевченко забил 370-й гол в зачет клуба Олега Блохина – Новости футбола — Динамо (Киев) (in Russian). Dynamo.kiev.ua. Retrieved 15 December 2011. ^ "Andriy Shevchenko". National Football Teams. Benjamin Strack-Zimmerman. ^ "Andriy Shevchenko – Century of International Appearances". RSSSF. Retrieved 15 June 2011. ^ "Всі матчі збірної". Football Federation of Ukraine (in Ukrainian). Retrieved 10 October 2016. ^ a b c d e f g Kartmann (29 September 1976). "Andriy Shevchenko – Dynamo Kyiv and Ukraine". Espacefoot.net. Archived from the original on 23 November 2011. Retrieved 15 December 2011. ^ "Commonwealth of Independent States Cup 1997". RSSSF. 25 November 1999. Retrieved 1 February 2012. ^ "GLI OSCAR DEL CALCIO: SHEVA AUTORE DEL GOL PIU' BELLO" (in Italian). AC Milan. 25 January 2005. Archived from the original on 23 May 2012. Retrieved 15 December 2011. ^ "The World Team of the Decade, as selected by John Cross". Mirror Football. 31 December 2009. Archived from the original on 18 December 2009. Retrieved 31 December 2009. ^ "Récompense UEFA pour les 'centenaires'" (in French). Fr.uefa.com. 11 October 2011. Archived from the original on 28 September 2011. Retrieved 15 December 2011. ^ "Ultime notizie sportive – La Gazzetta dello Sport" (in Italian). Archiviostorico.gazzetta.it. 3 October 2011. ^ "Les qualifs en chiffres" (in French). FIFA. 26 July 2011. Retrieved 15 December 2011. Wikimedia Commons has media related to Andriy Shevchenko.